While it may not be anything to “write home about,” it is reassuring that the market in the Highlands/Cashiers area is holding steady. Unit sales for April 2016 show normal sales for the last few years. 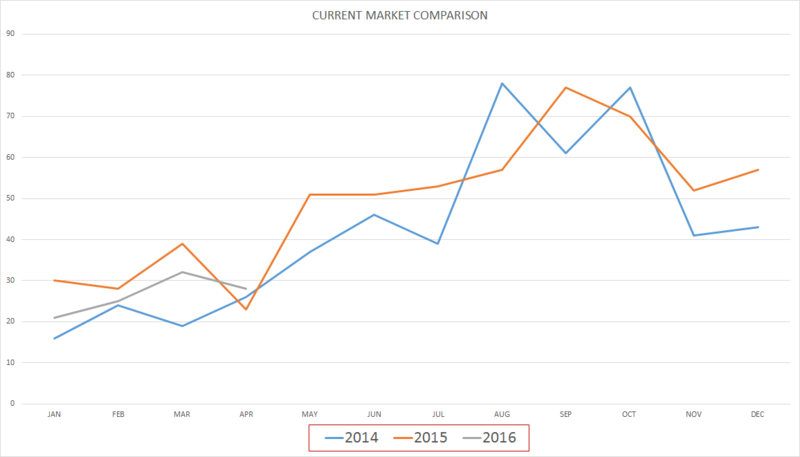 Although April 2016 did see a 17% increase over April 2015, this is only 4 more homes sold. FSBO’s (For Sale By Owner’s) need to leverage everything at their disposal to get their home sold. We are currently selling just over 2% of current inventory. There are approximately 200 brokers involved in making these sales happen. Although FSBO’s may pay a fee to be in an MLS, if they are not in the HCBOR/MLS local brokers may not be seeing their homes. If you’re a FSBO and want to know if you’re in the local MLS, just contact this broker or use this SEARCH FOR HOMES. Total homes listed in Highlands/Cashiers MLS: 1254 – This is nearly 100 more homes added to our inventory since last month. Homes Sold This Month: 28. Average Sales per Month 1 Year Average: 45 Since we have a “short” selling season, we use the 1 year average sells per month for statistical purposes. Inventory: 27 months – Remember, a healthy market inventory is considered to be 6 months or less. As the number of homes coming onto the market increase, we should expect the months of inventory to increase. This may continue to keep holding home prices down. Average DOM (YOY): 447 This number has dropped and now matches our DOM, which is a positive sign. Median Sales Price: $292,850 – This number continues to hover near the $300,000 mark. This is also a better indicator in that it shows the “middle” of the market. Average List/Sell Ratio: 90.21% -Take into consideration this is not the ratio from the “Original” List Price, but the ratio from the price it was listed when sold. The data from “Original List Price” shows the ratio to be at 88%. This is a strong indicator that buyers consider listed home prices as too high . Synopsis: Selling a home is not easy in this market. One should consider listing at a price to attract the most buyers. Listing like others means you will have to deal with Substitution. Sellers should price competitively, not comparatively. Total listed in all MLS: 1234-This number is rising, as expected. More properties added means more competition. Inventory: 94 months. We gained 10 months worth of inventory from the new listings added in April. One property with an assessment of $125,000 sold for $2,000. Another assessed at $160,310 sold for $61,900. Large inventories do not help land prices. Synopsis: No demand and large inventory means low pricing. 39% of home sales ranged from $200,000 to $499,999. This is the major portion of market sales. 21% of home sales ranged from $500,000 – $749,999. This was another significant rise in homes in this price range. 14% of sales were above $1,000,000. While unit sales are expected to increase, so is inventory. As a result, no change in opportunity for “expected” sales. Sellers, this is a tough market. While the number of homes is expected to rise significantly in the coming months, so is the number of homes that come back onto the market. In essence, no real change in opportunities to sell is expected, unless one has the pricing to entice buyers. Buyers, more homes and land will be coming available. No doubt, you will find a home or property. However, is that a bargain or will you end up upside down? You should find a broker that is very familiar with this area and its market. If you’re considering listing your home for sale or purchasing a home in NC, please feel free to contact a local agent or REALTOR®. They will make a specific report for your area of our MLS (Sapphire, Norton, Glenville, Highlands, Toxaway, Clear Creek, Breedlove, etc). You can then make an informed decision on how to sell or buy your home. This material is based upon work performed by Rick Creel, Broker. It is intended to provide an overall view of the real estate market for Highlands, Cashiers and surrounding areas of the Highlands/Cashiers Board of Realtors. It is composed of data from the HCBOR and NAR for this MLS only. Any opinions, findings, conclusions, or recommendations are those of the author and do not reflect the views of any others. There can be no assurance that this information is complete, accurate, or includes all available market data; all information is subject to change. Users of this information are advised to consult with their financial experts about the interpretation and usefulness of information contained herein. It is unlawful to duplicate or distribute the information contained in these reports. For more information or to consider listing your home with an agent or buying a home CLICK HERE. Available After Hours by Calling. About Highlands, Cashiers and Glenville, NC. Recent reviews by Rick C.
This web site is the personal domain of Rick Creel. Rick is a real estate broker for Hattler Properties. The views and opinions throughout this site are those of Rick Creel and do not necessarily represent the views and/or opinions of Hattler Properties nor its other agents/brokers. If you are looking for a Top Real Estate Firm, please consider Rick Creel and Hattler Properties to sell your lakefront or luxury home.